Who doesn't like to shop online? Admit it: online shopping isn't just convenient and fun, but it can be very therapeutic, as well. At least I think so. Well, have you ever wondered what it would be like to combine social networking with online shopping? This is where UShareThis comes in - a new online hub that is sure to become your latest obsession! UShareThis is shopping made easy, but with a very interesting twist! In a nutshell, UShareThis is a social store where you can share your unique finds from the Internet. Through it, you can help other people find interesting and affordable things with ease. Besides, the chances of you sharing the same interests with other people on UShareThis are sure to be quite high, so you can discover a lot of new things that you are sure to love in the end! :) It’s like treasure hunting. Everything you want in one place. tems that you like, organizing products as needed, and following the stores and the people that you like. Thanks to UShareThis, you can also share your style with the people that are most important to you and even ensure that you start getting gifts that you actually like in the near or distant future. A user-friendly interface and navigational system. Easy integration with your blog and social accounts. 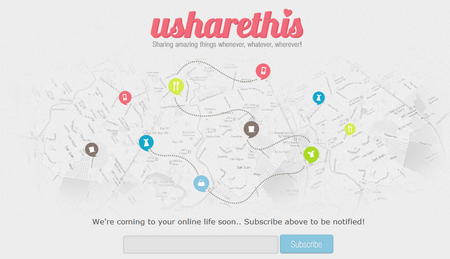 UShareThis hasn't launched yet, but it will very soon! For now, though, make sure to like them on Facebook and follow them on Twitter. :) Don't get left behind and join the fun as soon as now! Thank you for sharing! Sounds good! Pupung Goes SOLO This September! Enjoy and Relax at Il Terrazzo!